Romeo descends from generations of ceramic artists in the Naples area. He developed his own techniques and style while apprenticing to his family members. 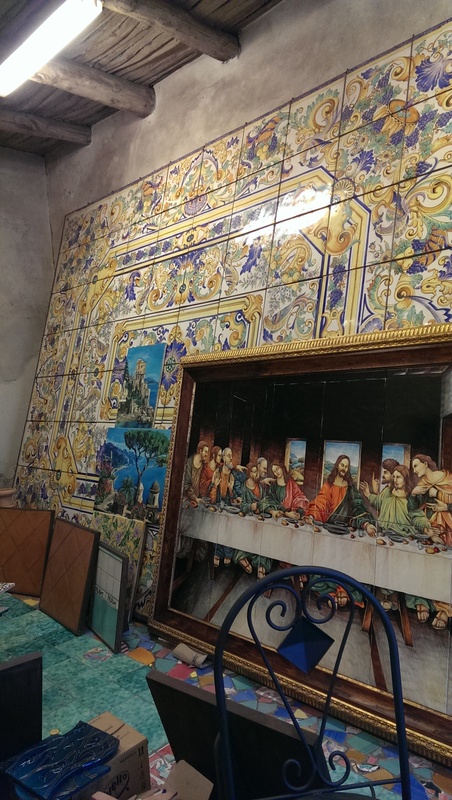 He learned their secret methods and took them with him to his ceramic studio in Vietri Sul Mare at the south end of the Amalfi Coast. My Cousin Sonseere and I visited with Romeo a month ago. His sister Sylvia and brother-in-law Guilio met us at Casa Ida, the bed and breakfast owned by the family, and they made us feel at home. The home actually is part of the family. It was Romeo’s mother’s home prior to her passing three years ago. It is a lovely 4-bedroom home in the city of Cava Dei Tirreni near Vietri Sul Mare. The structure itself has its own history. It was built in the 17th century and named for Raffaele Baldi (His Crest is quite visible in the entry.) A peace treaty was actually signed in the very kitchen of what is now Casa Ida ending a conflict in the 1800s. 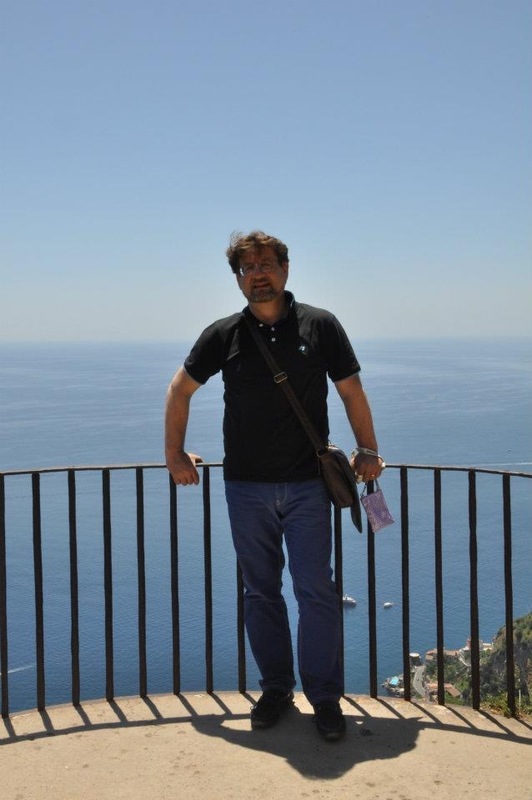 Romeo spent an entire day with us, showing us around the southern part of the Amalfi Coast. I fell in love with the town of Cetara. It is on my short list for a place to live. Vietri itself has its own, original air about it. 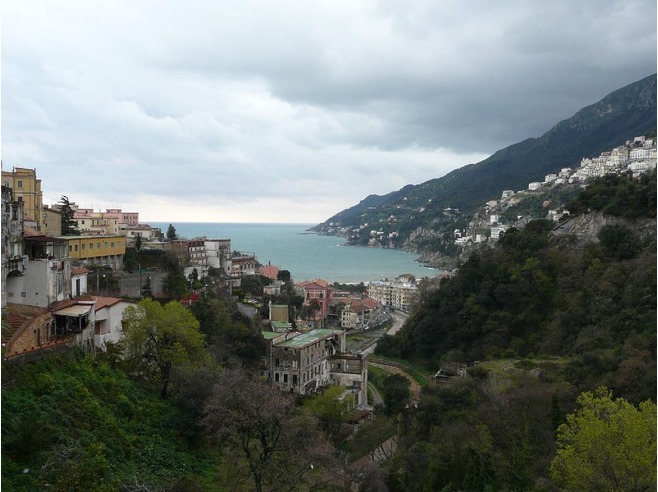 There are so many artisans living and working in Vietri Sul Mare that the atmosphere is like an Italian version of Grenwich Village in the 60’s, transported to the Amalfi Coast. I love the energy and beauty of the town and the artistic people. We visited Romeo’s studio where he has 5 artists working with him daily and others who assist with specific details of the design work. 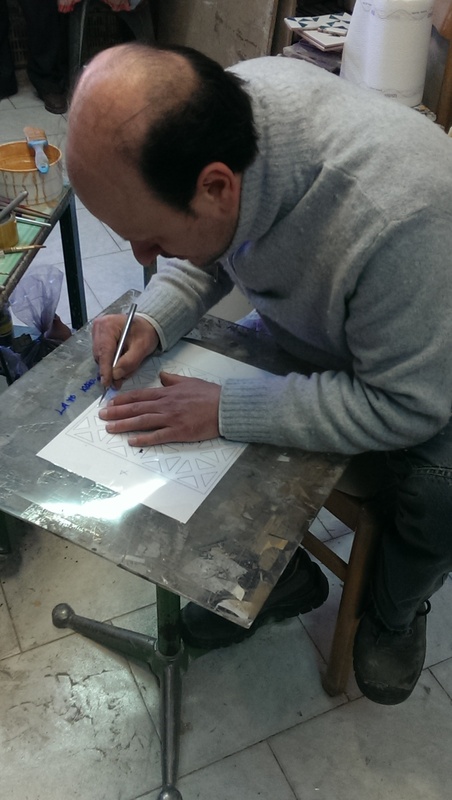 As we toured the studio, one of the oldest in all of Vietri Sul Mare, Romeo explained his process. First of all, almost all of the work done by Italian Decorative Art is customized for each future owner. 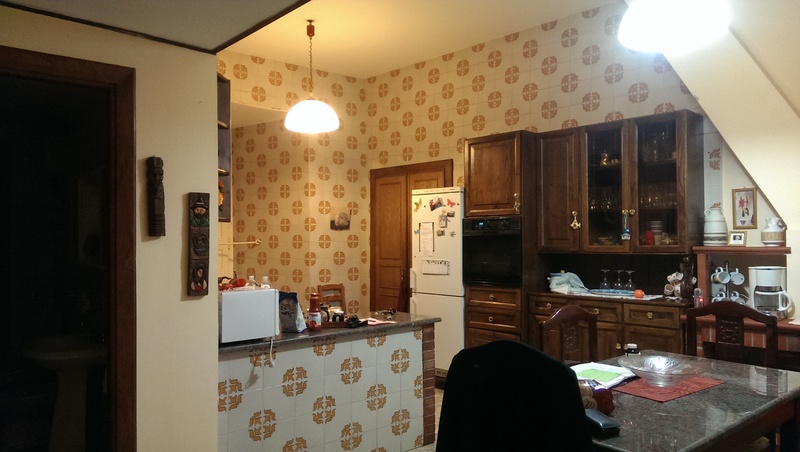 Items are not mass marketed with repeated patterns and colors. 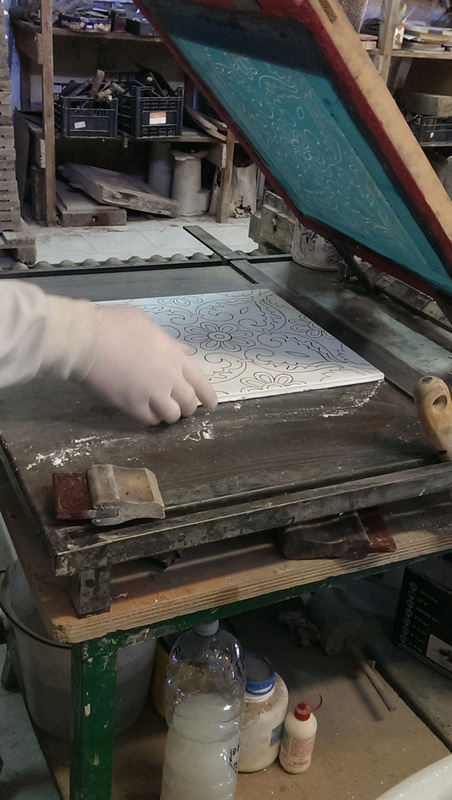 Secondly, Romeo’s team makes the tiles the way they have been made forever. They mix the natural clay with minerals until they are a powder. Water is added and the mixture is dried until it has the consistency of sand. 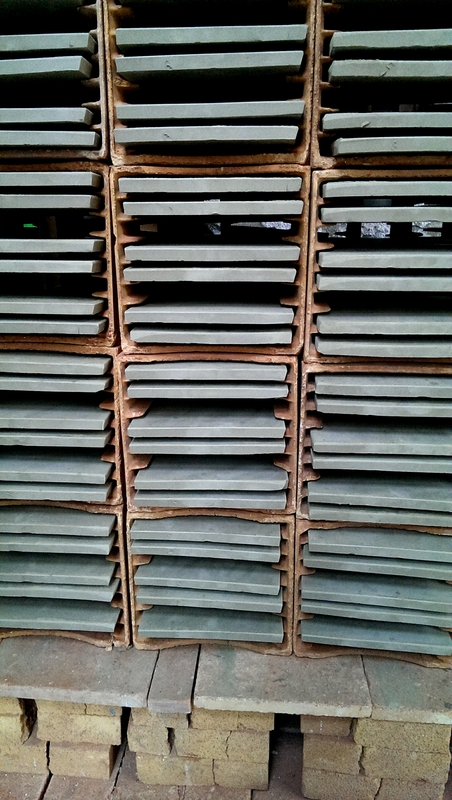 It then is pressed into a tile form, inspected and stacked to dry—drying time can be 7 days. Each clay object is glazed at least once. 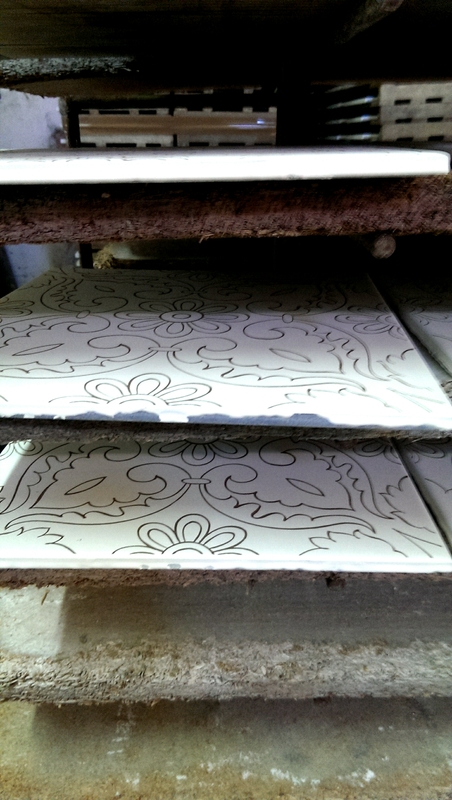 Biocutture, or twice glaze, tiles are often fired once and dried a week to 10 days, then signed, glazed again and fired again. Tiles must dry another time before working on them. Artwork can be free hand or specifically designs created for the customer. We watched patterned tiles being made. Above is the 1st step and below is the 2nd step. The artisan rolled something over the hand traced design while pressing the top glass onto the tile. Below is ready for the third step, the painting. Everyone at the studio was so friendly and so talented. They were very willing to answer our questions—we did our best with our limited Italian and they made the extra effort so that we would understand. As we left the studio I took one more look around at his samples and had a much greater appreciation for each piece. Each tile took weeks to create. Each vase, each plate, each cabinet knob was a work of art. I wanted to purchase it all. I plan to return and stay at Casa Ida. Would you like to join me? 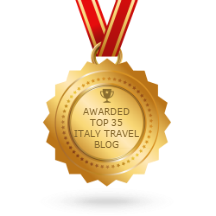 With my business, Take Me Home Italy, we can arrange your own visit where you can pick out your own designs. Also, when you stay at the B&B, Terri Affanato, Romeo’s business partner, can arrange all kinds of fun things to do—cooking classes at the B&B. Drives along the coast and, of course, a visit to the Studio. Come along. It will be fun. Let’s go! Andiamo!